Are you satisfied with your English learners’ (ELs’) equitable learning opportunities and parent involvement in your school? Join us as we explore the concept of advocacy and delve into issues and solutions specific to ELs in this six-week guided online course. Framed around the book Advocating for English Learners by Diane Staehr Fenner, the course is designed to help you explore the topics in a deeper way and to support you in applying what you learn to your own context. 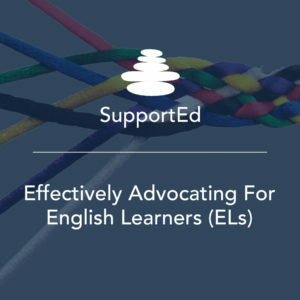 Over the three self-paced components, you will identify and use effective strategies to advocate for ELs in your own context to provide equitable learning opportunities and supported parent involvement in your school. The heart of this course is the Professional Learning Community in which you will interact with other educators and course facilitators from the SupportEd team. The PLC provides an opportunity to build your understanding and skills in advocacy while also contributing to the field by sharing your own professional experience. You’ll develop strategies to promote a school climate that builds on ELs’ strengths and supports a shared sense of responsibility for ELs. By the end of the course, you will set goals to address an EL advocacy issue in your context, empowered with a toolbox full of ideas and a network of supportive peers. Watch a brief video about the course here. *You will need to confirm the PD hours with your school or district. Bulk course purchasing is available. Contact us at info@getsupported.net to learn more. Purchasing this course will sign you up for the class. Our online courses are held on Schoology.com. A refund will be provided up until the starting day of the course less a $40 administration fee. No credit for future courses will be offered. Beginning June 24, 2019, course pricing will increase to the last-minute price of $275 per participant.